Up until December 2018, I’d never owned my own cabin case. Which is ironic given how much we travel. Instead, I’d always borrow my mum’s old little red cabin case, having to remember to pick it up from her house every time we went away. But then one day I heard about the Pro Cabin Case by The Travel Hack. For anyone who doesn’t know, The Travel Hack is an insane weekend travel blog by leading travel blogger, Monica Scott. Having been all over the world for the past 10 years, it’s fair to say Monica knows what a good cabin bag should and shouldn’t be, so I wanted to be the next owner of a Pro Cabin Case. As it was coming up to the festivities, I popped the Pro Cabin Case on my list last Christmas in the hope that I might find it under the tree. And there it was, sitting majestically on my living room floor on Christmas morning. Thanks mum! I was finally able to put this case to the test earlier this month on our trip to Iceland. We paid for one hold bag, but I took the Pro Cabin Case along with me too so I had more room for the millions of thermals I needed to pack. Post trip, I can tell you this this case is simply a dream to own. Let me explain why I love it! What is the size of the case? Although the 55x40x20cm, 28 litre case looks large, and trust me that was an initial concern when I unwrapped it, the Pro Cabin Case is absolutely fine to use as hand luggage on many airlines. You can see the full approved airline list here. I had no trouble slotting it into the cabin for both our outbound and inbound flights. How much room does the case have? The Pro Cabin Case is like Mary Poppins’ handbag. 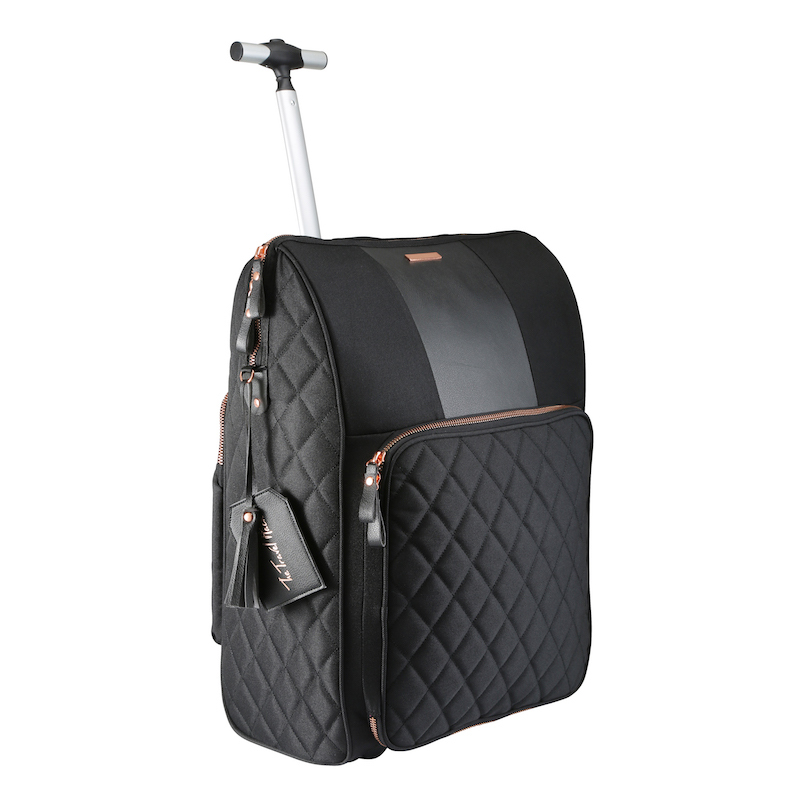 It has a back pocket which is ideal for travel documents and a laptop, it has a top compartment which is a lifesaver for storing the things that need to be within quick reach (such as liquids and passports), and it has a main compartment which is more than big enough to pack a long weekend’s worth of things. On top of that, it has an ID card holder, tons of secret zip pockets, internal packing straps and a water bottle holder on the side. Does the case feel high quality? Yes! Not only do the rose gold details, satin pink interior and black quilted exterior look high quality, but it feels high quality to use too. It’s ergonomically designed to roll along perfectly, and is a piece of cake to pick up by the carry handle when you need to lower the telescopic one. As someone who whizzes around airports, I had no issues pulling this case along behind me every step of the way. Would I recommend this case? I think it’s pretty obvious if you’ve read on this far, but for clarity I would absolutely recommend this case. I’m counting down the days until my next trip to be able to use it again! As a disclaimer, I have not been paid to say any of this. I really do just love the case.